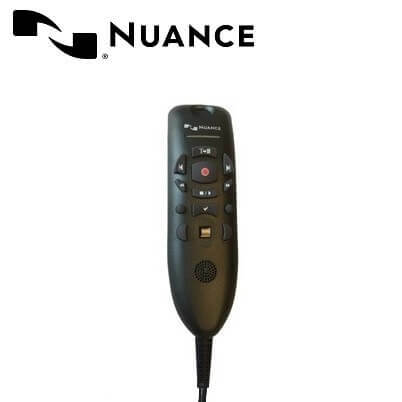 The Nuance PowerMic III Handheld USB Dictation Microphone is the recommended hand microphone to accompany Nuance’s Dragon Medical Practice Edition 3 speech recognition software, designed specifically for medical professionals. The PowerMic III microphone assists PC dictators with recording and voice control of navigation, streamlining user workflow for review and editing. Nuance has incorporated full-function, Microsoft-compatible PC mouse capabilities into the USB microphone, to reduce the need to move between the microphone, mouse, and keyboard. The PowerMic III makes navigation, voice control and selecting fields in on-screen templates and standard reports easier than ever. Moving through recognised text reports for review and editing is simple. The device has advanced ergonomic design which enables users to gain new levels of dictation speed, ease-of-use, and productivity.